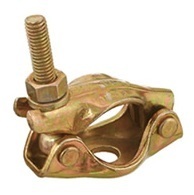 Leading Exporter of pressed half coupler and drop forged half coupler from Jalandhar. We have gained huge success in manufacturing best quality Pressed Half Coupler. We have developed highly durable half couplers using pressed steel to provide clamping on single tubes. Our offered range of half couplers is available in 22 mm and 23 mm nut sizes with 16 mm hole. Further, our prestigious clients can avail this heavy duty coupler in durable zinc plated finish from us. We are one of the reputable firms manufacturing new generation Drop Forged Half Coupler. 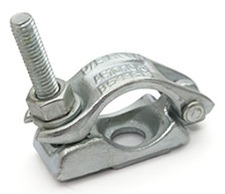 These couplers feature versatility in scaffolding and widely demanded where the application requires clamping on a single tube. The offered couplers are developed from forged steel fabrication and equipped with ½” BSW thread tee bolt that can be ordered in mild steel or boron steel fabrication.